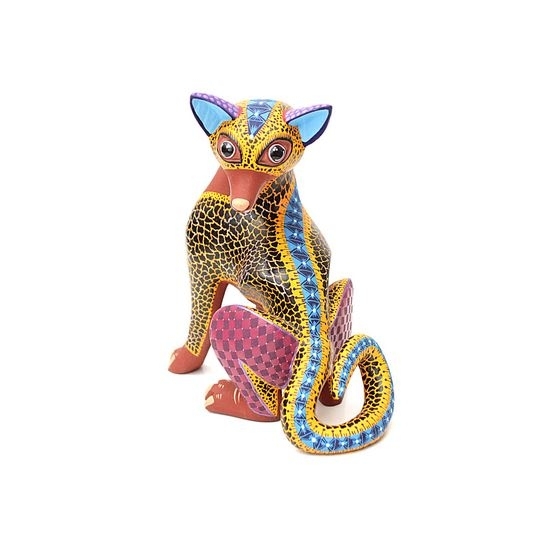 Amarillo is a genuine, one-of-a-kind, hand-carved, hand-painted oaxacan alebrije created by talented local artist Florencio Fuentes from Oaxaca Mexico -- distinctly unique and original. It was every parent’s worst nightmare. The young vixen had left her three kits for only a moment, but in that time the most mischievous one had ventured forth. Strolling to the far end of a log that stuck out into the river, and jumping up and down to get everyone’s attention, he had jarred it loose and was now floating out to the middle where the current would soon catch him and the log and propel them both to the waterfalls some half mile down the river. Mama was, to say the least, beside herself with desperation. Her frantic antics caught Amarillo’s attention, and as he worked his way over to where she was he was able to determine for himself what had happened. Whistling to his friend, Garcia, he began to lope along the bank, first gaining on, and then passing, the floating log. As the two male foxes began to pick up the pace, Armarillo was viewing the terrain in front of them in his mind’s eye, looking for a vantage point where he might be able to intercept the log and save the young fox stranded on it. There was a spot, he knew, about three hundred yards ahead where there was a bend in the river. Typically, things floating in the river tended to veer toward the shoreline at that point. If the log followed suit, that would be where it would be closest to shore and be in the most shallow water. Amarillo knew that if he could get there soon enough he could swim into the river and have the young kit jump on his back. It would be risky, he knew, for the kit would undoubtedly be reluctant to leave his perch, even though if he didn’t he would surely be swept away to his death. Now at a dead-out run, Amarillo made it to his point of entry and sat and rested for a moment. As they waited for the log to reach them, he explained his plan to Garcia, who eyed him speculatively. “That is a dangerous plan, no?” his friend asked. “Are you sure you want to do this?” Garcia asked, his tone indicating that he didn’t want to. “I have to,” Amarillo replied quietly. Saving the young fox was important, but maybe even more so was the fact that Amarillo had spent his entire life proving his bravery - - to himself if no one else. Interrupting his own thoughts, he began wading into the water and prepared for the arrival of the log and its unwitting passenger. Sure enough, as the log rounded the bend it floated in towards where he was waiting. With strong, powerful strokes Amarillo made his way to the log and the trembling young fox. Reaching his destination, he barked directions to the scared kit. Amarillo saw the fear in the other’s eyes, and himself feared that he wouldn’t obey the directions. Surprisingly, and fortunately, the kit took a deep breath, swallowed hard, and made a running leap, aiming for Amarillo’s back. It was a short flight with a perfect landing! Swimming skillfully he headed back to the safety of dry land. Waiting until they were out of earshot, Amarillo stopped and sat down facing his friend. With a huge sigh, he decided to open up his heart and share something with his friend that he had kept inside for a long, long time. Garcia smiled wisely and nodded for his friend to follow him. Going back toward the river, he found a clear blue pool and stopped. Amarillo did as his friend directed. Looking back at him was his reflection, and, for the first time ever, he took a look at himself. The first thing he noticed was the bright blue of the inside of his ears. Next he saw his rust-colored snout and under-belly. He admired his purple haunches, but as he pivoted slightly he saw something that made him gasp. For the most part, his body was yellow and black, with two prominent yellow streaks flanking a prominent blue one from the top of his head to the end of his tail. His face, too, was predominantly yellow, save his rust- colored snout. Turning to his friend he gave him a thankful, knowing nod. For now he understood that when all of those in his past had called him “yellow” it was not because they thought him cowardly, but rather because he really was a “yellow” fox!